Snow and ice protect the Arctic from overheating in summer. Firstly the brightness of the snow and ice cover ensures that most sunlight gets reflected back into space. Secondly, a lot of the sunlight that isn't reflected will be consumed by the process of turning snow and ice into water, which occurs while temperatures remain at the melting point of 0°C (32°F, 273.15 K). 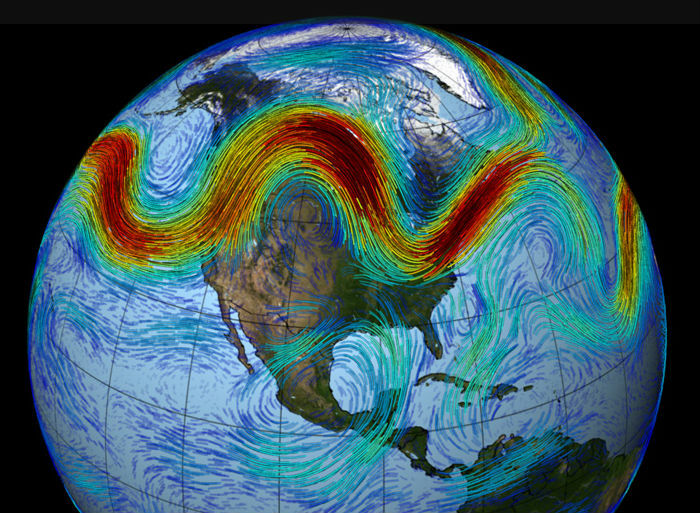 The Arctic is further protected from overheating by the polar jet stream, which keeps cold air in the Arctic and keeps warm air out. 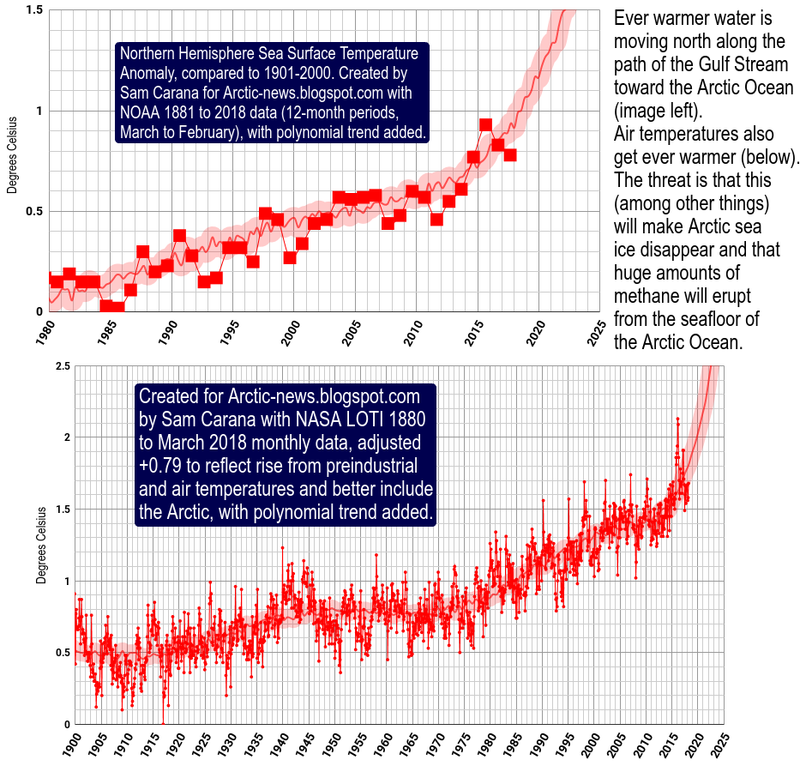 Accelerated warming in the Arctic can alter the polar jet stream in a number of ways, firstly by slowing its speed and secondly by increasing its waviness. Larger swings in the jet stream allow frigid air from the Arctic to plunge farther south, as well as warm, moist tropical air to penetrate northward, explains Jennifer Francis, research professor at the Institute of Marine and Coastal Sciences at Rutgers University. Accelerated warming in the Arctic comes with many feedbacks, and this "open doors feedback" is only one of them. Higher temperatures and more open water in the Arctic can also be expected to increase the danger that storms will batter the sea ice with greater ferocity. In many ways, it's opening the doorways to doom. 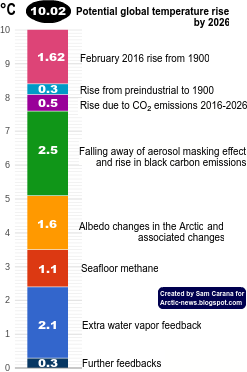 The biggest danger is that Arctic methane stores will weaken, causing huge amounts of methane to be released, triggering warming that could escalate into runaway global warming. Locations where effective measures can be taken to stop runaway in your diagram are at #1, reducing emission of greenhouse gas and by reduction in soot or fire reduction and things like good forest management. Carbon's lag time for expression is buffered by the Sea hiding the urgency of the situation which is key. Sequestration of carbon by putting charcoal in soil and stuff like protecting forests, particularly mangrove and sea marsh grasslands seems like a place a huge number of jobs could be created to benefit the common good.. Also in tech to make clean energy and to keep food and Nature's biological heritage forward of forces that would extinguish it.. Tech to actively remove greenhouse gasses already released too..
Tech and science to along with infrastructure building try and keep people alive and Nature too..
Mankind had been dancing to the fiddle of wanting the good life like a dance held on a hair trigger of the glacially checked slowness of clime change being able to express itself. Finances have gone global and haven't connected the link between keeping Earth alive and wealth. 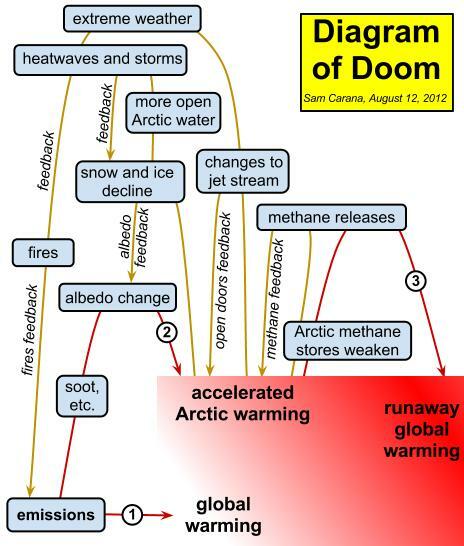 The Arctic, changes in the Arctic are explosive in their potential to send Earth into lifeless condition. All rests on decision to Also Known As change. --That is if Earth, all the nations agree to try and stop global overheat and total loss of life. The Southern Hemisphere is talking about refuge treatment and canoes going out on reenactment of how islands were settled but the Earth is changing and the Northern Hemisphere, it with its industry and proximity to Arctic with the huge CH4 release that will take off as sea ice cover on pole is lost is not taking things seriously either about the extent of loss of control people have on influencing Earth's fate.